Plantacote® sets new standards in controlled release Plant Nutrition. This is valid for the concentrated nutrient composition, for the safe and adapted nutrient release as well as for the coating technology which ensures optimum crop safety. promotes plant stability and the formation of flowers. 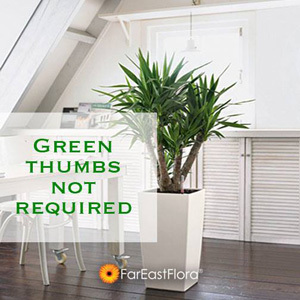 Depending on the longevity, fertilization of container nursery stock, production of bedding and balcony plants, cultivation of potted plant seedlings, fertilization of flowers and shrubs for amenity areas and cultivation of cut flowers, for crops with high potassium demand. Each Plantacote® fertilizer granule contains the main nutrients nitrogen, phosphorus and potassium. Depending on the product type, magnesium and trace elements could be added. This ensures a homogenous distribution of all nutrients in the growing media. The nutrient release is regulated by a semi-permeable membrane which completely coats the fertilizer granule. The specific thickness of this polymer coating determines the longevity of nutrient release. crop safety and a consistent release effect over the specified longevity. Before Plantacote® was launched, damage to CRFs from mixing, freezing conditions or high temperature could be a problem, leading to flash release and thus salt scorch. The Plantacote® coating is not only outstandingly tough, it is also so flexible that the strains of even major temperature changes are taken in its stride. Plantacote®’s state-of-the-art coating protects your crop and protects your profit. 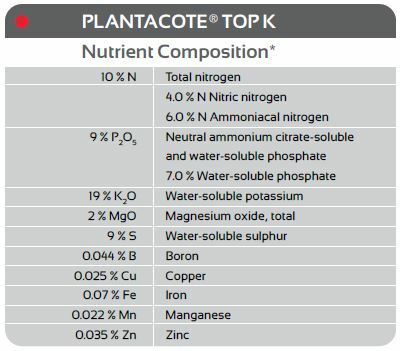 All grades of Plantacote® release their nutrients according to the temperature of the growing medium. Nutrient release is unaffected by substrate type, pH, microorganisms, or the amount of irrigation water used. and require lower levels of nutrients. Under warmer conditions plants grow more quickly. After the release period, the Plantacote® coating is broken down by chemical and physical processes and microorganisms.